I thought you might like to read one of the 50 sample college application essays featured in my new book, Heavenly Essays. This is the first one in the book. Like most of the essays in this collection, it was written by a former tutoring student of mine. I will share a few others in the next couple weeks. Like I say in the book, I believe reading examples of essays written by other students is one of the best ways to learn how to write your own. 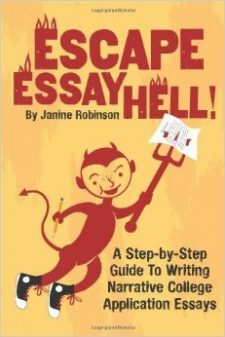 Not only can these essays give you ideas for your own topics, but you can get a feel for the style that works best—narrative (storytelling) writing. You also can get a sampling of my mini critiques after each student essay. My goal with each “analysis” was to help readers use these samples to recognize creative writing techniques that make narrative essays compelling and effective, and try them out in their own pieces. Dangling about 30 feet above the ground, I looked down on the entire neighborhood park with its rolling hills, vibrant green grass, and multiple tall eucalyptus trees. Buckled tightly in my brand new Diamond Mountain climbing harness, I admired my handiwork. My old blue-and-black braided climbing rope thrown over a branch held me aloft, while a slipknot I tied while hoisting myself up prevented my descent. After a few minutes, I decided to return to the ground, but realized my knot grew too tight for me to untie. I was stuck. Ever since my dad taught me the Bowline in second grade, the intricacy of knots has fascinated me. I spent hours mastering the craft, reading every knot book and website I could get my hands on. All my knots usually came in handy. In 8th grade, I won a competition in the Boy Scouts with a square knot, beating the instructor who taught an alternative knot that took longer to tie. A couple years later, I rescued my brother’s pickup out of the mud with the unbreakable loop of the Bow Line during one of our off-road adventures. I even returned a stranded rock climber’s lifeline by tying a Sheep’s Bend between a small piece of paracord and his climbing rope. Ironically, on the day I got stuck in the tree, I spent all morning trying to finally conquer the biggest and baddest knot of them all: the Monkey’s Fist. After at least 50 failed attempts at the step-by-step process, my trusty blue rope finally bore the complex, dense sphere of rope. With a heavy Monkey’s Fist on the end of my rope, I could throw an end over any branch. After hoisting myself into the treetops that day I dangled for several hours due to that hastily tied Slip Knot. When my dad finally returned from work and saw me, he lugged over an extension ladder, and laughed as he untied me from the tangle he inspired years earlier. When I reflected on this adventure, I realized another irony in the situation: It took a complex knot like the Monkey’s First to elevate me into the tree, but a simple Slip Knot stopped me from getting back down. Comparing these knots, I learned that the effort and persistence I invest in a challenge like tying a knot translates into a certain lasting power. A Slip Knot is extremely easy to tie, but disappears with a quick pull on the rope. However, a Monkey’s Fist takes hours to learn and minutes to tie, but is impossible to untie. In so many other parts of my life I have experienced this similar relationship: that the more I try, the more useful and permanent the reward. I expect that my knot-tying adventures, and the related lessons, even the most embarrassing ones, will help me through any future hang ups I encounter from here on out. ANALYSIS: When Brock was brainstorming for topic ideas, he knew he had a strong interest in engineering. So we started by thinking of qualities, talents and interests he had that would make him an effective engineer. One of the qualities was that he was a problem solver. And one of his hobbies was knot tying, which is a form of problem solving. Aha! The next step was to find an example of Brock applying his problem-solving skills in real life. A great way to find compelling real-life, mini-stories—also called anecdotes—is to think of “a time” you faced a problem. Problems can come in many forms: challenges, obstacles, crises, phobias, idiosyncrasies, life changes, etc. When Brock mentioned the time he got stuck in a tree because of his knot-tying ability, we both knew instantly he had hit upon a hot topic. When you read this essay, notice how naturally this self-deprecating anecdote and knot metaphor showcase Brock’s insightful thinking and engineering prowess—as well as his natural humility. You don’t always need to title your essays, but when you land on a witty one like Brock’s “Hang Ups,” it only makes it that much better.